Top Bananas | An Augmented Reality Keyboard? What it is: Apple filed a patent detailing a new, adjustable keyboard that uses augmented reality as well. Most computers come with lousy keyboards. That’s because most people don’t care about the keyboard so they’ll settle for mushy, cheap keyboards. For touch typists and gamers, keyboards can be a crucial link to a computer. In the past if you wanted a solid keyboard, you had to get one with mechanical switches. This gave the keys more durability plus gave touch typists tactile feedback. The big problem with any keyboard is that they wear out over time and users have to adapt to the keyboard. 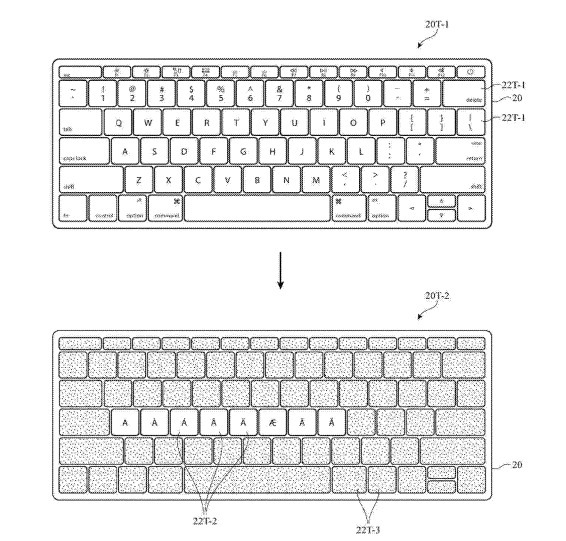 That’s why Apple’s latest patent shows an adjustable keyboard where you can define the stiffness and feel of the keys. This can be handy to adjust a keyboard to your preferences, or if the keyboard gets old and worn out, you can adjust its feel to compensate for this worn-out feel. Even stranger is that Apple’s keyboard patent also includes an augmented reality feature. Physical keyboards are stuck offering dedicated buttons while virtual keyboards offer the ability to switch keys and modify them. So Apple’s latest patent involves using augmented reality to overlay different letters and characters on a physical keyboard. This gives you the advantage of a virtual keyboard while offering the tactile feedback of a mechanical keyboard. Of course, you can’t view augmented reality by holding a mobile phone or tablet in front of your eyes all the time, which means this Apple patent hints at smart glasses. That way you can view different keys on a keyboard while wearing smart glasses to give you a different experience using a computer. If Apple’s latest keyboard patent becomes a reality, that hints at a wildly different type of Macintosh computer in the future where you can physically adjust the feel of a keyboard and use smart glasses and augmented reality to change the keyboard like a virtual keyboard on an iPhone or iPad. Keep your eyes on Apple’s latest patents. They often hint at the future to come. To read more about Apple’s latest patents, click here.